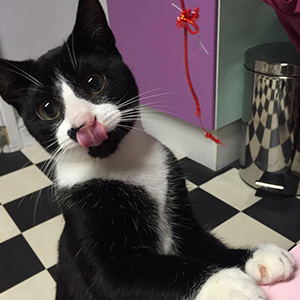 Tyrian was one of the smallest cats when she came to the café, yet the most adventurous and daring family member. Although she has gotten bigger she is still small, her size doesn’t bother her, because she’s very mighty, which is why she got her name! (After the G.oT. character) She can switch from play mode to stroke mode faster than our other cats, which makes her super friendly even at the younger age of 2 and a half. Her favourite hobby (of course after trying to steal the cream from your hot chocolate) is climbing across our bridge! 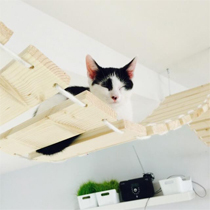 She even naps up there for some peace and quiet, if she isn’t napping on the bridge she is usually squishing Rum or Sybil, trying to nap on them. You will probably find her coming over and giving you a good sniff to suss you out. If your very still, she will climb on to your lap for a short while and will never shy away from a stroke – before going off to chase something again! 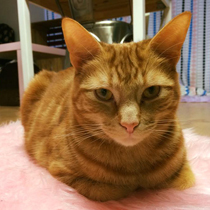 Tokyo is the brother to our Jaffa, but these two ginger tom cats could not be more different! Eventually, Tokyo became uninterested in the other cats and used to hide under one of the tables. However we noticed our regular customer Saffron who visited every week, had developed some sort of bond with Tokyo! He would roll over for her, let her touch is belly (which is a huge sign of trust) and go to her when she walked through the door. So of course if Tokyo was to be happier in Saffron’s house, we decided that’s where he should live! Now they are very happy together indeed. As the daughter of Gizmo and sister of Sir Francis, Maggie defiantly has just as strong noble character, although it was noticed that she was the more timid of the family. Often she’d be by Gizmo’s side looking for comfort and attention from her mother. Unfortunately these feelings weren’t mutual, sassy Gizmo liked to do her own thing. 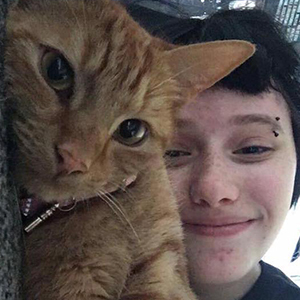 We became concerned that she may not be happy living with a group of other cats so in turn made the decision to move her to her new home with one of our cat slaves, Maggie has adapted quickly and now lives with a variety of reptiles. She now has the run of a mini zoo! Tinks used to like sitting up on the shelves in the cafe and keeping herself to herself. 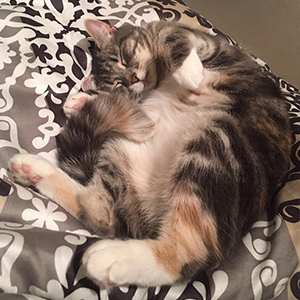 She has also been an outdoor cat but was rescued due to being pregnant, so she had the urges to go outside. We would take her out on her harness but that wasn’t quite the same. She now lives with Cafe owner Katie in the countryside, where she loves to catch field mice and bring them home as presents! She’s so happy now to freely go in and outdoors.